This 20 Amp Variable Power Supply varies its output voltage from 1.5 to 15 volts and is based on the well-known variable voltage source configuration, where only the LM317 voltage regulator is used. See red box on the diagram. 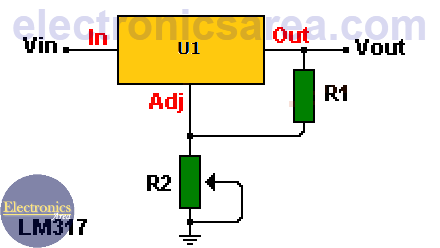 The output voltage of this basic regulator is adjusted with the potentiometer connected to the regulator pin 3 (adj). On this power voltage source, the level of the output voltage is regulated in the same way. The basic regulator has a maximum current capacity of 1.5 amps. (acceptable for most cases). 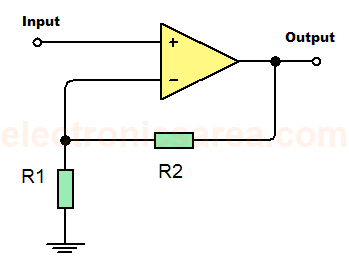 To amplify the current capacity of this regulator we place four power NPN power transistors as shown on the diagram. How the 20 Amp Variable Power Supply works? 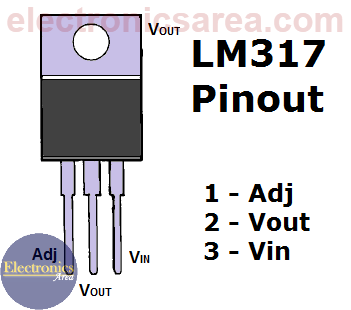 The output of the LM317 voltage regulator (pin 2) is connected to the 4 power transistors bases. These transistor are conected in parallel. 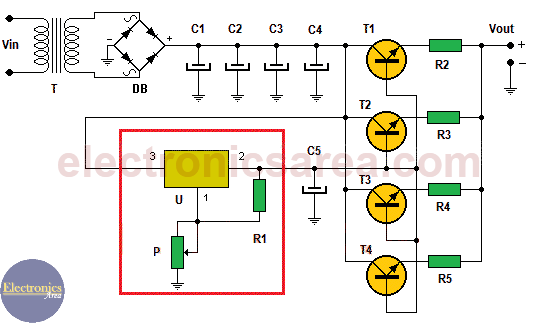 The output voltage of the 20 Amp Variable Power Supply is obtained from the junction of the 4 resistors (R2, R3, R4, R5), connected to the emitters of the 4 transitors.
. 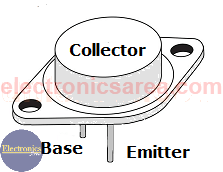 The transistor base-emitter voltage drop is between 0.6 to 0.7 volts. Resistors in series with each emitter are placed in order to compensate for voltage differences that may exist among the 4 emitter voltages. 4 4200 uF / 40V electrolytic capacitors (C1, C2, C3. C4). 4 0.47 ohms / 10 wats resistors (R2, R3, R4, R5).